The BU-353S4(5Hz) includes an embedded receiver and an antenna. This receiver up to 48 tracking verification channels while providing fast time-to-first-fix, precise position updates, low power consumption, and adds the capability of Wide Area Augmentation System (WASS). The BU-353S4(5Hz) design uses the latest technology and high-level circuit integration to achieve superior performance while minimizing space and power requirements. All critical components of the system include the RF/IF receiver hardware and the digital baseband are designed and manufactured by GlobalSat to ensure the quality and capability of the GPS. The BU-353S4(5Hz) can be utilized in a variety of applications that require a permanent mounting configuration. With magnetic mounting and a low-profile housing, the BU-353S4(5Hz) is completely self-contained. 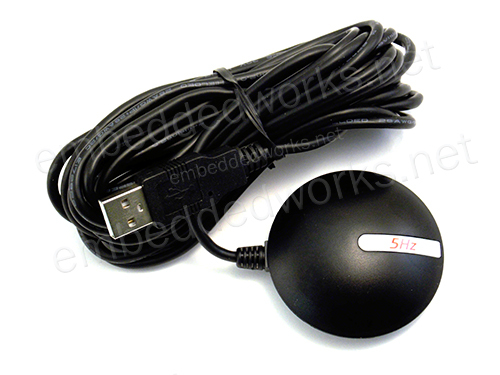 The USB interface allows an easy interface to a USB supporting device like Android or a PC. The extended 4.5 meters cable allows for easy routing to your equipment behind, headliners and side panels and terminates to a USB connector. 5Hz NMEA Output after GPS Positioning.